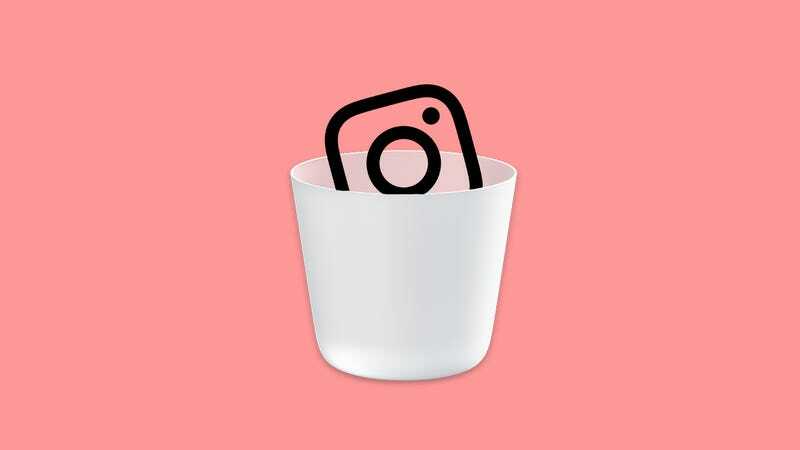 Filed to: delete instagram?Filed to: delete instagram? Instagram is simple and fun, which makes the idea of deleting it seem unpleasant. In many ways, it’s fun in the same sort of way that Facebook used to be fun. You share updates about your life with your friends, and you can also see what they’re up to. You do this with photo posts or Stories, a popular feature that Instagram stole from Snapchat. You can also see what celebrities are up to, since all the cool celebrities have fun Instagram accounts that give you a glimpse into their exciting lives. You can even get to know a new type of celebrity called an Influencer by following them and liking their pics. Sometimes, these people get paid to do posts about products, which can get them in trouble with the Federal Trade Commission (FTC). Facebook is different. The social network turns 15 today, and plenty of people think that Facebook has evolved into an evil behemoth that ruins democracy, enables genocide, and makes Mark Zuckerberg richer every day. Most people are well familiar with Facebook’s role in spreading misinformation and failing to fix the problem. Last week, we also learned that the company was paying teens to download an app that gave Facebook unlimited access to their phones. While a privacy violation of this scale is hardly surprising for Facebook, the timing was a little bit awkward. News of Facebook’s latest scandal arrived just a couple days after The New York Times reported that Mark Zuckerberg and his minions would be integrating messaging features across Messenger, WhatsApp, and Instagram. And Instagram?! That’s the Facebook app my friends haven’t fallen out of love with. Does this mean that Instagram is about to be awful and invasive as well? Some would argue that it already is. After all, Instagram is an integral part of the larger Facebook ad empire. Not long after Facebook announced in 2015 that it would start serving ads on Instagram, the company bragged about how advertisers could simply check a box to run their campaigns on both platforms. This is just one indication of how tightly Instagram is bound to the Facebook platform. In fact, if you want to buy an ad on Instagram, you use the Facebook ad tool. Those ads can also use both your Facebook and your Instagram data to target ads. So if you like Major League Baseball on Facebook, you shouldn’t be surprised when you see ads for Mets tickets on Instagram. The scenario gets more sinister than this. In recent months, Facebook has become infamous for using opaque methods to track almost everything you do online. In effect, the social network spies on you to serve you more targeted ads. Its methods have become so creepy, elusive, and effective that a conspiracy theory emerged: Facebook (and, by proxy, Instagram) was using your phone’s microphone to eavesdrop on your conversations and serve you ads based on what you talked about in the real world conversations. The theory gained so much momentum that Facebook released a statement denying that it used phone microphones for ads or News Feed Stories. Not long after this statement, a group of researchers conducted a study and found no evidence that Facebook used microphones to eavesdrop, but the reality of how the company does ad targeting is perhaps more concerning. Bluntly put, it’s almost impossible to know exactly how Facebook (and again, by proxy, Instagram) is monitoring your every move. Online, for instance, the company uses a tracking pixel that websites can add to their pages and collect data about your activity that then gets sent back to Facebook. Facebook also lets advertisers upload databases of people that it wants to reach, and Facebook will show those people the ads. Facebook even uses location data to watch what you do, where you go, and target ads accordingly. Those are methods we know about, but all of the data Facebook collects gets mashed together and optimized by an unknown number of algorithms. As Antonio García Martínez, the former Facebook engineer who helped build this ad targeting technology explained in a Wired column, Facebook’s secret algorithms are so good at figuring out what you’re interested in that the company doesn’t need to record your conversations. Now let’s get back to Instagram specifically. It’s a free service. In exchange for unknown quantities of your data and your attention to ads, you get an elegant app for sharing photos and keeping in touch with friends. For some, this is a good deal. For others, Instagram is starting to feel creepy, and we have every reason to believe that this feeling will get worse. A few months ago, Instagram co-founders Mike Krieger and Kevin Systrom left their jobs at Facebook, after reportedly clashing with Mark Zuckerberg over the direction in which the Instagram was heading. It’s not exactly clear which new features bothered the Instagram co-founders, but it’s worth remembering that Instagram was originally just an ultra basic feed of photos with no messaging, no location tracking, and most impressively, no ads. Following Krieger and Systrom’s departure, Zuckerberg promptly installed his longtime lieutenant Adam Mosseri to run Instagram. Mosseri is best known for masterminding Facebook’s News Feed which is also, arguably, the site’s most hated and destructive feature. This means there’s every reason to believe that Instagram is about to look a lot more like Facebook. In the near term, that might mean your Facebook messages and Instagram messages will end up in the same place. In the long term, it could mean that all of the same tech that makes Facebook feel invasive will make Instagram feel gross, too. Furthermore, hyper-targeted ads are only part of the problem when it comes to Facebook’s history of rampant data collection. The super scary thing about this is that Facebook has developed an awful reputation for protecting its users’ data. Facebook admitted that the Cambridge Analytica scandal alone led to the data of up to 87 million users being improperly shared. It’s chilling to wonder how bad the next security breach could be. So if you’re already one of those Delete Facebook folks, you should be a Delete Instagram person too. You might also be someone who loves Instagram, doesn’t mind the data collection, and feels comfortable about informing Facebook of your every whim and action. It’s unclear what Facebook will do with Instagram in the future. It appears that Zuckerberg’s vision is to make Instagram look and work more like Facebook by making the apps together work more seamlessly. After all, that’s how the ads work already. The skeptics out there will wonder how Facebook’s misinformation problem might spill over onto Instagram. We already know from the Fyre Festival disaster how influencers on Instagram can lead thousands of people to believe in a false reality. That whole debacle, now frighteningly depicted in dueling documentaries on Netflix and Hulu, bears some resemblance to the Facebook’s 2016 election catastrophe. Of course, suggesting that Instagram will be the next front in the war on fake news would be pure speculation.